Ocean Sports currently has Full or Part Time positions (3 – 4 days per week) open for Beach Crew at Anaeho’omalu Bay. You must be able to work till 5:30 PM, and be available weekend days too. Our Beach Crew works with guests from all over the world, helping them to experience fun, safe experiences at the beach. 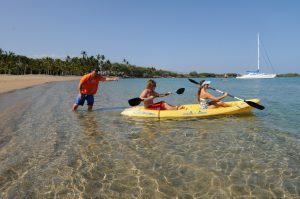 As a Beach Crew person, you’ll help launch guests on beach toys, keep guests safe in the water, and even lead water adventures in the bay on kayaks, Stand-Up Paddleboards, and our outrigger canoe. No prior experience is required (we’ll train you), but preference is given to those with an ocean safety background.